Your background- how long have you been baking? What got you started? Have you been cooking for the allergic community long? I have been cooking and baking since I was 10 years old. I am now 22 years old. I started cooking because I wanted to learn ways to prepare food for my family and I that were free of allergens as well as being delicious. Later on, I decided to learn more about how to create dishes using new ingredients and cooking techniques by getting my associates in culinary arts. I wanted to delve deeper into why foods were good for us and how thy replenished our bodies, so I pursued a bachelors in culinary nutrition. I have been cooking for my family and myself since I was 10. I am allergic to tree nuts and have several oral allergies. My older brother has food allergies to peanuts and tree nuts. My younger brother is allergic to peanuts, tree nuts, fish, shellfish, dairy, and eggs. I have always had an interest in making meals for us because of the great times we’ve shared being with friends and family around the dinner table. What was your first reaction when you were told your client had allergies? Does cooking for an allergic eater scare you? No, I have cooked for this population since I was young so I feel confidant in knowing which steps and precautions to take. What precautions do you take when baking for a client? Buying ingredients the client is familiar with and has tried before. I only buy brands of foods the client has had before to try to alleviate any anxiety about new foods. Most times the family does not have the allergens in the house or has a dedicated area where the allergens are kept. Therefore, I make sure I keep the area I’m cooking in free and clear of the allergens. 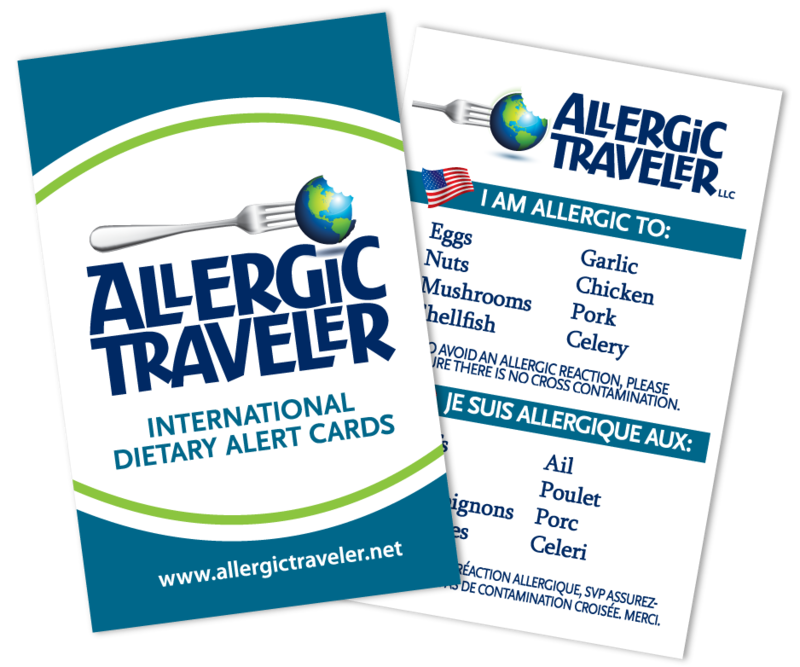 Do you know anyone in your immediate circle that has food allergies? If so, what has it taught you? My older brother, my younger brother and myself all have allergies. I also have acquired a new “little sister,” Marysa, I teach nutritional cooking classes to once a week. She is a 10-year-old, vivacious and curious budding chef! We have lessons once a week in which she tells me a certain dish or food she has always wanted to try, but hasn’t had the chance to since they more often than not contain many potential allergens. We work together measuring and preparing the ingredients until we have a finished product. I love seeing the excitement and joy on her face when she gets to enjoy a new meal she might not have had otherwise. Cooking with Marysa has taught me to maintain adaptability in making foods not only safe for her to eat, but to her liking. Sometimes 10-year-olds can be picky, so I have to be creative in working in those fruits and vegetables!! Do you have any tips for those catering/cooking for the allergic community? Be aware of products you buy. Ingredient lists sometimes change, even when you use the same brand. You have to make sure you check the labels EVERY time to make sure the list hasn’t changed or become cross-contaminated. Most importantly, cooking for a food allergic client is no different than cooking for someone without allergies. Everyone wants and deserves a delicious meal that was prepared with care and love. When baking, do you use substitutes? If so, why? Ener-g as an egg replacer. This has been the most versatile and egg-like when used in baked goods. Fleischmann’s unsalted margarine for baked goods holds up well without being greasy. Coconut milk in the place of milk in baked goods. This adds a luscious and moist texture to the baked good without being soggy. What is the most challenging thing to cook and why? Some baked goods because often times you have to tweak the amount of egg replacer or fat to replicate the “real” cake taste without being too greasy or too dry. Do you make recipes that are two versions, for instance chocolate cake with eggs and chocolate cake without? If I am cooking for a client, I only make the allergy friendly version of the cake. Most of the guests can’t even tell it’s an allergen free cake unless I tell them! And finally, do you find it hard to cater to the allergic community? I find it to be an exciting challenge because I love seeing people’s eyes light up when I make them something they’ve never had before. Below you will find a recipe that Tessa has shared with us. This works for many, however if you are allergic to something, e.g. garlic, please apply substitutes. The following recipe is peanut, tree nut, dairy, egg, fish, and shellfish free! 1. Peel and dice the butternut squash into 1” cubes. Reserve the seeds, rinsing completely, and letting sit on a paper towel to dry overnight. If using pre-cut butternut squash, don’t worry about not having the seeds. These are purely used as a garnish, and you can substitute toasted pumpkin or sunflower seeds. 2. Toss the butternut squash with 1 tablespoon of olive oil, onion, and garlic cloves on a foil-lined baking sheet. Place in a 350°F oven for 45 minutes. Next, turn the oven up to 400°F and roast the vegetables for an additional 10 minutes. This can be done up to a day in advance, chilling the vegetables overnight in the refrigerator. 3. Toss the dried butternut squash seeds with 1 tablespoon of olive oil. Bake the butternut squash seeds on a sheet tray in a 350°F oven for 10-15 minutes, until seeds are golden brown and crunchy. Set aside to cool while making the rest of the soup. 4. Brown the bacon in a large soup pot. Remove the bacon and drain on a paper towel, reserving for garnish. 5. Remove all of the bacon grease from the soup pot before adding in the roasted butternut squash and onions. Over medium-high heat, cook the vegetables for a few minutes. Add in the dried herbs and stir to coat. 6. Pour in the chicken stock and bring the soup up to a simmer. Turn the heat completely off and use a stick blender (food processors or regular blenders work well, too) and blend until the desired consistency is reached. Some people like the soup completely smooth and some like it a little chunky. 7. Turn the heat to low and let the soup simmer for 10-15 minutes before serving. 8. 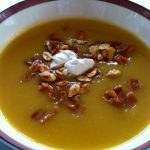 Ladle soup into bowls and garnish with bacon bits, roasted squash, pumpkin, or sunflower seeds, and/or a dollop of soy sour cream. This soup is delicious when it’s warm on a winter night or you can refrigerate it to enjoy on a cold summer day! Note: For a vegetarian version, leave out the bacon and substitute vegetable stock for the chicken stock.